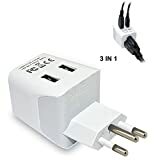 There are multiple receptacle types used in Brazil (A / B / C / I / N). However the standard one fitted since 2010 is the type N receptacle. As this is a relatively recent standard you may be faced with any one of the receptacles pictured to the right. 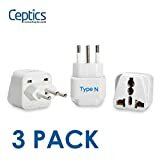 Couple this with the fact that we have been unable to locate a supplier of a type N adapter and you'll definately be best off with a decent worldwide adapter that is a single unit capable of connecting to multiple receptacle types. Frequency - The frequency is 60 Hz which is the same as the US. Special considerations - Type I is becoming common for 220 V outlets and appliances in 127 V areas. Dual-voltage wiring is rather common for high-powered appliances, such as clothes dryers and electric showers which tend to be 220 V even in 127 V areas. Depending on the area, the exact voltage might be 115 V, 127 V, or 220 V. The A, B and C types are sometimes together (flat with rounder ends and ground pin) so that an A, B or C type can be used. Also note that by Jan 1st 2010, Brazil converted to the IEC 60906-1 international plug (type N) which looks similar to type J but is not compatible. Since then, all devices shall comply with new standard.